Happy December. We want to extend a heartfelt thank you to you for making your family a part of our family! Reflecting on the past year, we are tremendously grateful SWIMkids USA received numerous prestigious awards that distinguished our organization and our leadership as best-in-class. We appreciate knowing these designations are validations that we’re on the right track with the specific methodology we follow to help children love to learn. Here are more things we are grateful for! Melissa Sutton: I am grateful for my family, health and work and for the heightened way that during the holiday season we often think of others. We try to visit family more often during this time or reach out to friends and family we haven’t spoken with in a while. When I was a child, we used to go out to the family’s 40 acres and spend hours searching for the perfect Christmas tree to cut down, haul back and set up in our living room.Those trips also included instructions on how to get the tree down (if in a dense part of the forest) and how to drag it out – especially on those instances we had hiked a mile in. And then, the decorating began! That was worth every moment of cold and hiking through snow up to my waist. Oh, how I loved to decorate the tree – and still do! Nathan Askins: I am so grateful for all the wonderful families and children that I have been blessed to teach this year. They all have played such a wonderful part in my life and I am so happy to know all of them. On Christmas when I was a kid, my sisters and all my cousins would sleep over at my grandparents’ house. We would wake up early and my grandpa (who loved Christmas more than any kid) would line us up youngest to oldest. He would bring us to the door that led us to our Christmas present. He would let each child peek through the door for a millisecond, building up the anticipation before Christmas morning began! Shaunna Risinger: I am grateful for my family. I am also grateful for being able to work with so many amazing families and little ones each day. I love my work family and I have the best boss anyone could ask for! My favorite would have to be road tripping to Arizona for Christmas with my family. I loved spending Christmases out here as I grew up in Michigan and loved packing shorts and t-shirts for a December/January trip. SO many great memories were made on these trips. 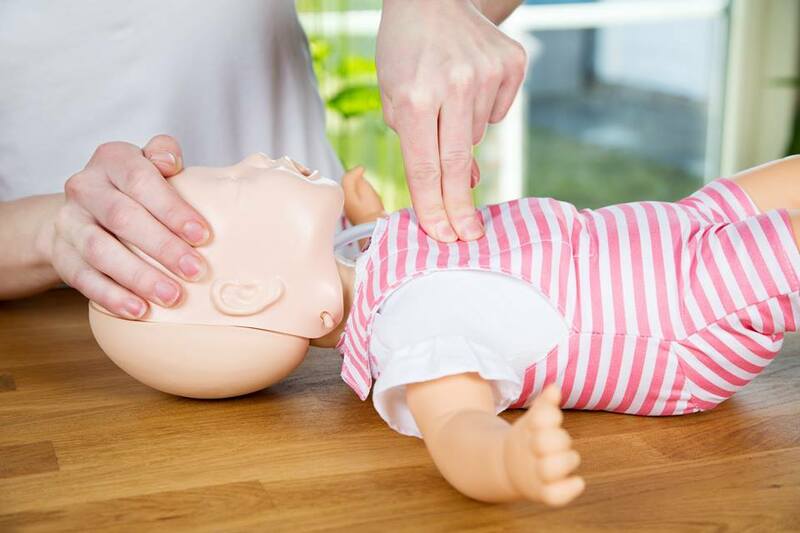 Baby CPR – These three things may surprise you! When Amanda Acuna’s daughter was a baby, one minute her girl was eating Cheerios in her high chair and quick-as-a-wink, the next minute, her daughter was choking. The hope is that we’ll never be put in the scary position of having to save a baby’s life, but the truth is there are many quick-as-a wink situations that can and do happen. Babies can and do choke on food or slip under the water in a pool or a bath tub, the list goes on. CPR stands for cardiopulmonary resuscitation and it is a lifesaving procedure you can perform when an accident happens. CPR is often used in drowning and drowning is the leading cause of death for children between the ages of 1 and 4 in Arizona. In addition to being a mom who expertly helped her child in a choking situation she is a master aquatics instructor, lead StarGuard/ASHI Trainer and CPR instructor for SWIMkids USA. Here are the top three things she says often surprise parents about CPR. 1) CPR for infants is different than CPR for adults and children! 2) Most CPR classes will also have a part about choking strategy. 3) CPR DOUBLES a person’s chance of survival in an emergency. CPR makes a difference. Be the one who makes a difference. SWIMkids USA has a mission to save lives, and family education is a part of that. We encourage every family to provide layers of protection against drowning. These layers include supervision, barriers (like pool fences), swimming lessons, and CPR. Drowning incidents leading in death are greatly reduced when more layers of protection are in place. This is why we offer drowning prevention education, survival swimming lessons, and CPR classes.